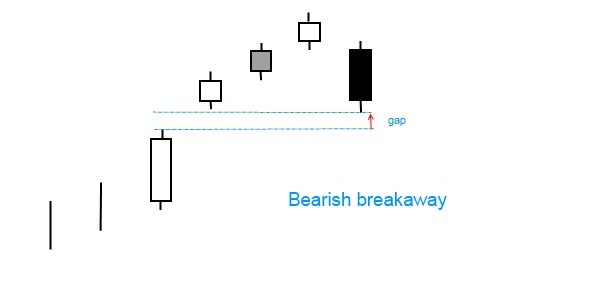 The bearish breakaway pattern consists of five candles. It is a reversal formation that occurs during an uptrend. The first candle in the formation is long and white. The second candle is also long; price opens higher creating a gap. The third candle can be both black and white, but does not cut off the rise of the stock price. The fourth candle continues in the direction of the preceding trend. The fifth candlestick has a long black body, changes the direction of the trend and continues in that direction to close the gap. What happens when a bearish breakaway is spotted? The uptrend is accelerated by a gap up. The trend continues on the next few days, however the swing slows down. The last day of the pattern shows a breakdown and close below the previous three days, however the gap created on the first day remains unfilled. Because the gap is unfilled and the trend is failing, this implies the reversal. It is a rare pattern and not so reliable. It occurs during an uptrend; confirmation is required by the candles that follow the pattern. It has a bullish counterpart: bullish breakaway.